A Toluca Leafcutter Bee perches on a plant. Two nature surveyors this month discovered a red-legged Toluca Leafcutter Bee at the National Butterfly Center in Mission. It’s the first time the bee species has been spotted in the U.S. The Toluca Leafcutter Bee had been documented in Tamaulipas, Mexico, but American Museum of Natural History bee experts John Ascher and Jack Neff identified it in South Texas through photographs taken by surveyors Paula Sharp and Ross Eatman. The bee was temporarily captured and released back to its home at the National Butterfly Center. 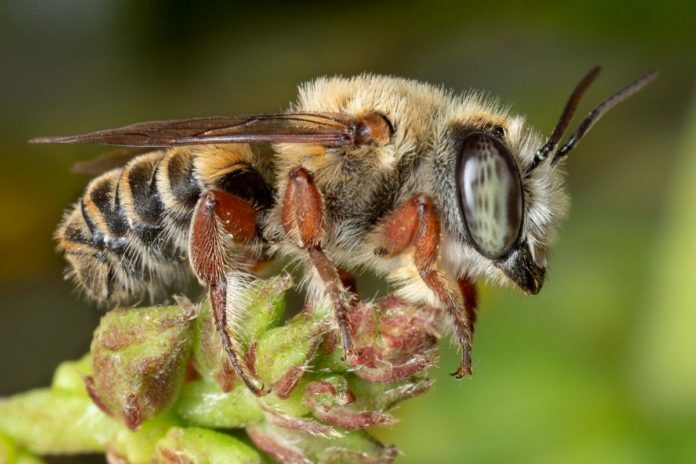 The male bee, which was found to use Texas snout bean as its food source, has not been documented anywhere else in the U.S. Leafcutter bees carry pieces of leaves to their egg chambers, according to Sharp and Eastman’s website. The National Butterfly Center allows researchers access to the property through an application process, according to the center’s Executive Director Marianna T. Wright. The bee researchers documented 20 different species at the National Butterfly Center. The bee may look similar to other species. It takes experts and researchers to properly document bees in the U.S. The newly recorded bee likely made its way here because its food source was planted at the center. Sharp and Eatman’s work will be showcased at the Houston Museum of Natural Science world bee exhibit in 2019. The two photographers will return to the center this fall. The pair also found a Honey-tailed Agapostemon, Aztec Sweat Bee, California Digger Bee, Sunflower Chimney Bee, Crooked-legged Bee and American Honey Bee on the National Butterfly Center grounds.